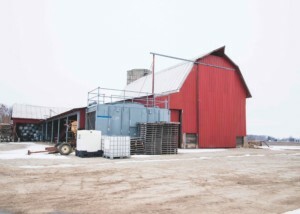 The barn at the home of MBPN Treasurer Tom Irrer has a 25 foot-high door and is used to store dry fertilizer for this mint farm. With 125-ton capacity, it keeps fertilizer on the farm ready to be spread and is refilled frequently with large semi loads of fertilizer. The mint still on this farm is being readied for this summer’s harvest. The mint production process was explained during the tour, and his new Victorian house was opened for a morning coffee break. The structure contains several antiques and uses split stone reclaimed from an old barn as part of its foundation.